I know you’re constantly planning to grow your hotel business. And this time, I’ve got just the right tips for you to have your way around the hospitality industry. The hospitality industry is the one which is ever evolving; being at the forefront in comparison with other trade. Every other day, you may be finding some practices becoming obsolete; waiting to be replaced with new ones in order to meet the dynamic scenario. With the travel industry registering a growth trajectory of 3.9% per annum globally, there’s an abounding potential market awaiting you to grow your hotel business. Likewise, total Travel and Tourism GDP is expected to account for 11.4% of global GDP and global visitor exports are expected to account for 7.1% of total global exports. By 2027, the travel industry is expected to support more than 380 million jobs worldwide. Your consistent efforts, investments, marketing tactics and resources to make your hotel business a success make it worth for you to strategize on gaining higher returns. Suffice to say, with the burgeoning demands and upping technology, all you need to do is start afresh with crisp ideas in 2018; to grow your hotel business. Technology is one such practice which you can adapt for this new year. It’ll not only make your work easier but benefit you for years to come. Determining online travel agents is a priority for any hotel that has plans to make it big in the hospitality trade. There is a misnomer of connecting with 2-3 OTAs being sufficient for managing hotel business. However, its always suggested having more OTA connections for your hotel. An appropriate hotel description, listing out your amenities and posting clear images of your hotel will keep you in the forefront and make you visible to others on the OTAs. Focus on direct bookings. 2018 is meant for that! As I’ve repeatedly mentioned and pointed out, nearly 2/3rd of your guests prefer direct bookings. You know, most hotels these days are working towards increasing direct bookings on your hotel website. Engage with your guests, understand their needs and purpose of visiting your hotel, and try upselling other facilities at the hotel. The best part of gaining direct bookings is, you save a significant part on OTA commission. AND, in turn, you earn a long-term loyalty of your guests. Step 1: Start with optimizing your hotel website; make it mobile friendly. Just as you do that, get a booking engine and integrate it with your website. That will ensure that your guests will be able to book with you on your website itself, from any device and any location. Step 3: I’ve one more. Enroll in Metasearch engines like TripAdvisor, Trivago and Google Hotel Ads which redirect guests on your hotel website driving direct bookings too. Hotel Digital Marketing is a proven and the most effective method to help a hotel get more bookings. Say goodbye to the old school methods of traditional marketing. If you haven’t yet done this until now; this is the time to welcome the new aspects of digital marketing to grow your hotel business. That includes SEO for your website, Social Media Marketing, Email Marketing, Paid Advertising; and well, the list is endless. Try your luck in any or all of these, and see how it works out for you. Reach out to your guests from these mediums, and I’m sure it will turn your bookings and revenue upside down. From what I know, this is the year of Video Marketing. Video content on your YouTube channel, hotel website or even OTAs will garner huge attention by your potential guests; leaving a lasting impression on them. Whereas many guests live stream their events on Instagram and Facebook which they’re participating in. These check-ins will give your social media profiles an instant visibility. Responding to the feedback from your clients is vital for any business; let alone hotel business like yours. This year, you need to be agile with your online reviews. Be on a constant lookout for any kind of reviews you have; be it positive or negative. You most certainly know that the more your guests post positive reviews, the more likely it is for you to get bookings. A single negative review out of many positive can downturn your business in no time. Business growth is directly proportional to the positive reviews. That’s why a competent reputation management strategy is a must to maintain a positive image of your hotel. 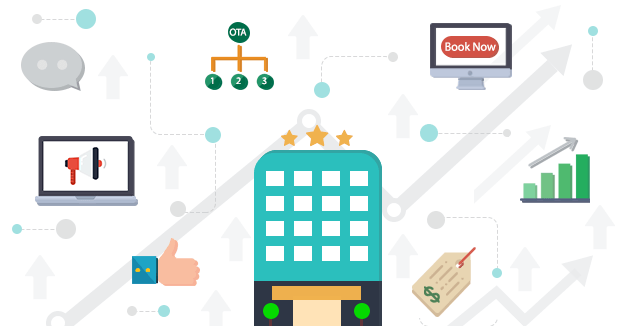 Apparently, setting up right pricing plays a prominent role in helping you grow your hotel business. Given the competition in the hospitality trade, it is imperative for any hotel to plan their inventory pricing that attracts more guests. Keep an eye on what your competitors are doing, determine the pricing strategy they’re employing and devise your own. What more you can do is, put together flexible pricing of your inventory depending on the seasons, occupancy and even number of guests staying in a room. This will yield maximum for you with new guests day in and day out. So, what you need to do to grow your hotel business in 2018? Revise your OTA distribution strategies. Connect with your guests at a personal level. Focus on direct bookings through digital marketing. Keep an eye on your competitors and their pricing methods. Employ an effective reputation management plan for your hotel. In a nutshell, you have to focus on overall trade and start planning to grow your hotel business this year. eZee has everything you need to take your hotel business to the next level. A complete package of seamlessly integrated solutions, letting you automate and simplify your operations right from bookings, front-office, back-office, inventory distribution, restaurant management and guest feedbacks. Join our network of more than 10000 smart hoteliers to grow your hotel business now!